I love Advent calendars! I thought we could swap Christmas cards and make our own Advent calendars. I will host 6 similar swaps so in the end you will have 24 envelopes with cards and you can open one each day in December 1st to 24th. 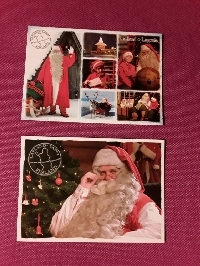 In this swap you will send 1 Christmas card to 4 partners. Cards can be folded cards or postcards but you have to send them in an envelope! Write on the envelope clearly the swap name and your Swap-bot name so your partner can rate you right away and open the envelopes in December. Write a nice seasonal message to each card.